We did it! Not only did we survive a 3-day trek from Illinois to Colorado, but we survived the drive back home! 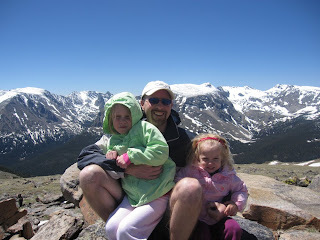 We promised the girls that we would climb a mountain, and hiking up that ridge did the trick. The girls were great hikers! We really wish we could have spent more time in the Park, but the time we spent there was great. We also took them up to the tundra and found some snow. Lily wrote her name in the snow, and Emmy threw a snowball at her daddy. It was very cold up there in the mountains! Color me green with envy! That is absolutely gorgeous! Did you get my email? SO BEAUTIFUL! And YAY to kids not needing to be carried!!! Wow, I can't believe you saw snow in June, that's INSANE! No snow here in FL, just extreme heat. We haven't been anywhere but we're going for a beach weekend in a couple of weeks. Glad you had a fun trip! Colorado is so beautiful!! I've only ever been to the Denver Airport (layover), but I've always wanted to see more of the gorgeous Rocky Mountains. 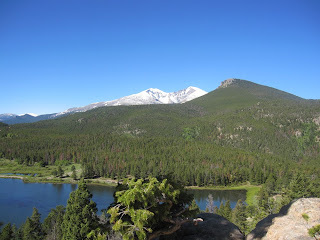 I love Rocky Mtn. National Park. I haven't been there in a very long time. We always made that trip from Illinois too! Yea! You were almost in my backyard! Isn't it beautiful there, and crazy how cold it still gets! I love the picture with all the snow in the background! What a beautiful location and experience! The girls will never forget it! I visited national parks as a child and those memories have never left me. Ten days with two young children, you deserve a medal.